Quick write: What does a grade mean? Read an article by Tom Guskey on using zeroes in grading like this one. I've got to tell you, in the late nineties, those conversations would ignite teachers! Many of the teachers then believed kids should be "held accountable" or "penalized" for not doing an assignment. Many could not understand why I would "give" my high school students no grade or a 50% F if they had turned nothing in. In some places, teaches still believe those things. Singapore American School recently hosted a Solution Tree Institute: Professional Learning Communities at Work. It was the first time I'd heard Tom Schimmer speak. He is a fabulous story teller, and speaker. His review and teaching about assessment affirmed my thinking and validated everything I know to be true about grading. He cited many educators I'd read and some I haven't, so I mapped out some learning for myself. I love to learn and I am passionate about equity and fairness in grading practices. How did I miss Grading from the Inside Out last year ? I don't know, but I'm reading as fast as I can now. My son learned to walk on a different day, and at a different age than my brother's daughter did. His path to learning to read was different than his buddy Ethan's path to reading. As Richard Allington has said every time I've heard him speak over the past ten years, research has proven one thing definitively about learning: kids are different. So, pair that with the idea that we teachers need to demystify the learning process for students. Remember when we were demystifying the writing process and how we "grade" writing? We need to do the same thing for every standard we assess. 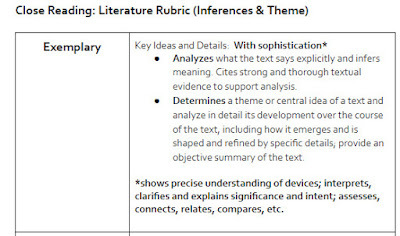 The SAS rubric draws directly from the language of the reading standards one and two (citing textual evidence and analyzing theme). Each level of this rubric repeats the same language with different qualifiers; the approaching level, for instance, uses the words "attempts to", instead of with sophistication. At my former school in Florida we had been using Marzano's scales to score students. I led a grade level team and worked for several years to develop and revise scales for each of the standards we taught. Those scales are still changing because what we understand about learning and learners changes. The first scales our teams made embarrass me now --I wrote about them this very week in 2013. What was I thinking with the bird metaphor? How is labeling a learner dependent or limited mitigated by also labeling him or her a fledgling or nestling? Our early teams struggled to come to consensus on language. I've been tinkering with my scales from last year. Here is my most recent iteration. In my daily practice the steps to the skill -- teaching kids how to analyze a theme (or deconstruct an argument) has weight and purpose: kids attend and practice in the one on one conferences over their work in reading journals over the course of the quarter. They see clear steps and act on the feedback they get on their bi-weekly writing (we're on a rotating block here). Still, it's a work in progress. 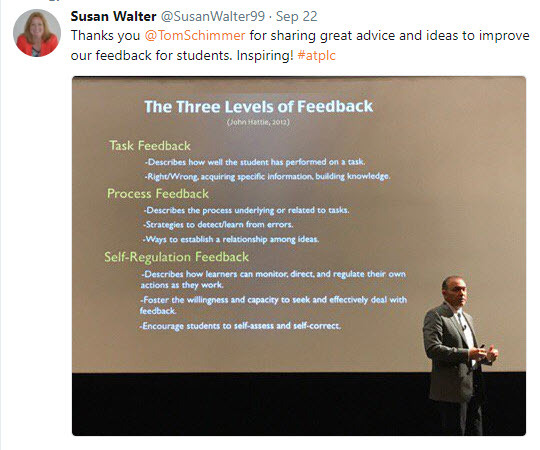 What I've learned since Maya Wilson's Rethinking Rubrics book study many of us did on the English Companion Ning, is that feedback really matters. Learning progressions, called scales at my former school, called rubrics here-- are tools I can use to make feedback clear. I have to give kids feedback (and encouragement ) as quickly as I can to support their learning. I have to tell them where they are on track and were they need to do more work. I need to be systematic about about tracking what I say to whom, and when, so I can check back in and I need to monitor or keep an eye out: are kids acting on my feedback? You know, if they are not , then maybe I need to rethink my delivery. I'm working on that part next. for hosting the weekly link up. I learn so much by writing and reading with you all. Maja has a new book coming out (time to be determined!). I can't wait to read it. And I'll be snagging the Schimmer book too! Thanks, Lee Ann! It's wonderful to continue to learn beside you! 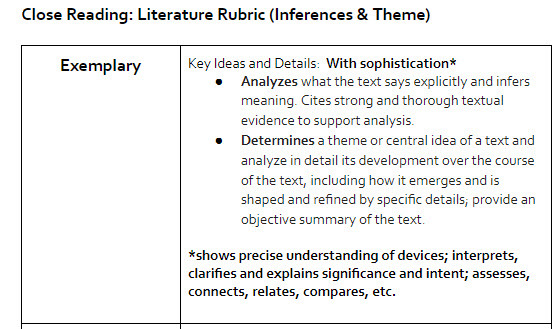 I remember the book study of Maja Wilson's 'Rethinking Rubrics In Writing Instruction." It was a defining moment that reaffirmed my own thoughts about rubrics. In terms of how I assess student work, I have to think about more than one approach. 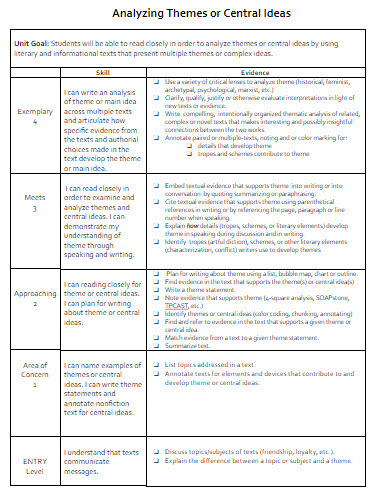 For example, teaching an Early College Program class necessitates my using the university's assessment criteria, but I have modified it to make it more specific and relevant to my students, and I spend a lot of time prior to final speeches assessing student work informally. By the time we get to speech day, students have a very good idea about how I'll assess their final outlines and their speeches. That advance work really pays off for both students and myself. In AP Lit I have two requirements for earning an A: Do all the work (lots of opportunity to finish what a student misses) and improve. We're running a marathon, not a sprint, but since kids can earn college credit through a junior college, I have to keep that school's expectations in mind. Still, I have the first trimester in this year-long class to train students for what's to come. Last year 70% of my students who took the exam scored in the first quartile on the free-response section of the exam. That was gratifying and affirmed this pacing. My kiddos this year need a gentle touch and more scaffolding. I'm teaching two sections of juniors second trimester, and I really like your assessment device. I know I'll have students who don't love reading and writing the way I do, and I want that for them. Well, enough. I love getting a peek into your thoughts, Lee.